An affordable way to measure your postural sway! The BTrackS is an ideal tool for identifying fall risk or tracking postural sway (balance indicator) over time. The unit can be used with any evidence-based program including all fall prevention programs. The software provides measurement for baseline testing, all subsequent test results, comparisons from prior evaluations, and comparison rankings from national averages. Ideal for reporting requirements, recording program outcomes, testing participants’ befores/afters -- especially completers of EB programs. BTracks™ is perfect for community health fairs, grand openings, wellness fairs, annual exams and screenings, fall prevention workshops, balance testing events, residential care facilities, in-home visits, initial first day health promotion program testing, and more. The BTrackS balance unit includes everything you need including the testing plate, easy-to-install software*, easy-to-use readouts, and attractive marketing materials. Plugs into any laptop or tablet instantly and the unit is completely portable and lightweight (weighs only 15 pounds). It’s simple to operate and requires very little training. Just follow the easy-to-use, step-by-step instructions. 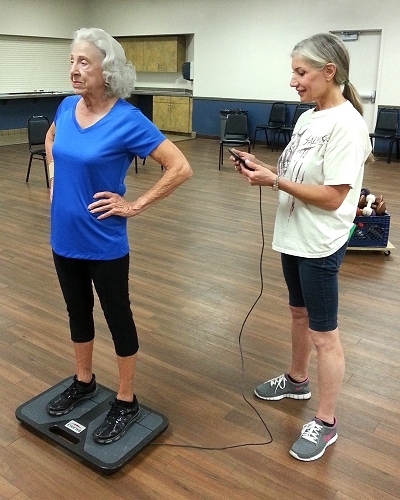 Each test takes approximately three minutes to complete and will measure and record an individual's postural sway. Recommended screening for all fall prevention programs! A test result of over 40 suggests that an individual is at a higher risk of falling. Order online or by phone with your Visa or MasterCard. Your order will be shipped directly from the manufacturer within 2-3 weeks. Do you need a portable laptop computer to use with your BTrackS? We sell brand new HP laptops with pre-loaded software... nothing to do, just turn it on and you're ready to begin testing. * All BTrackS units requires a $19.95 annual software renewal fee. Includes current software version and any upgrade to system requirements.